Bop was first published in 1983. The magazine is advertised to tween girls ages 9 to 14. The company that publishes Bop also publishes another tween magazine, Tiger Beat. They are featured on the same web page and are very similar in nature and audience. 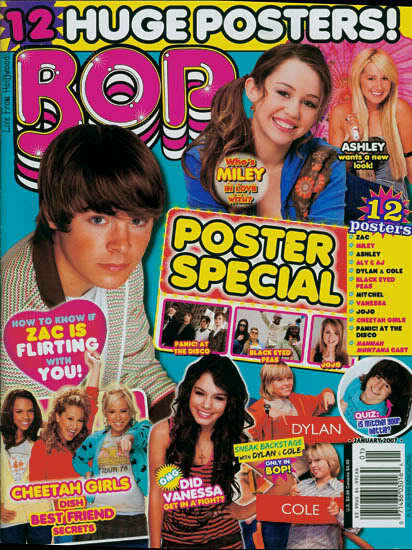 There are mainly pictures and posters in Bop magazine with few articles. The articles that do make it into the magazine are of high interest to tweens. They interview stars and give advice. Also the are recommendations to other sources of entertainment. Movies, books and television shows are reviewed in this magazine that appeal to tweens. There are sections in the magazine that are fun and have puzzles, word games, horoscopes, quizzes and embarrassing moments. Fashion and make-up are also popular topics that get special pages devoted to them. In some issues the magazine has contests that give away a variety of prizes. Bop has a lot of competition in the market but girls love the big posters and the articles that talk about their favorite stars. Bop will be around for much longer and will always find their way into tweens girl’s rooms and hearts. Bop is marketed towards tween and teen girls that are interested in celebrities.